As my career progressed from practitioner to executive, I found that what I set aside at one point (practicing information architecture) I revisited as I became responsible for organizations. Information architecture is a valuable skill for anyone designing how teams and organizations grow and operate. IA tools such as labeling, creating taxonomies, and lumping and splitting ‘right-size’ categories were essential to the crafting of “Org Design for Design Orgs.” It applies information architecture to the development of principles of a successful organization, the creation of roles within a design team, how people navigate their career through a levels framework, and the evolution of a design organization. I’ve long felt information architecture did itself a disservice by being so closely bound up with end-user experience. There are countless valuable applications of “IA Thinking,” and organization design is one. 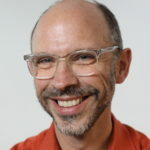 Peter Merholz has been active in digital design and product for 25 years, most notably in building Adaptive Path, and now a design executive, product leader, and organizational consultant. He co-wrote Org Design for Design Orgs (O’Reilly), the first book focused on the organizational, managerial, and operational challenges of building in-house design teams.